Eastern Senior High School senior Adonte Yearwood thought he would spend his Wednesday morning presenting about the college application process at an informational panel for juniors. Instead, he was surprised with a free education at his first-choice university. 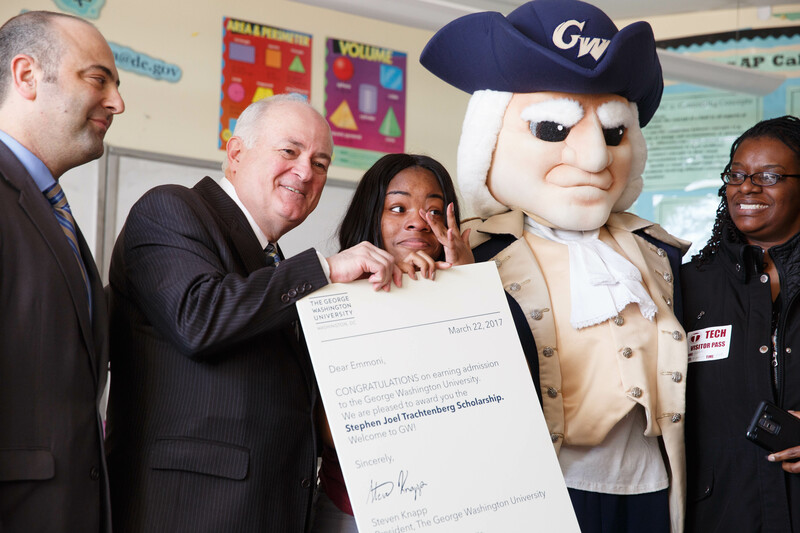 Mr. Yearwood clapped a hand over his mouth, beaming, as George Washington University President Steven Knapp—followed by the GW mascot, members of the university admissions office and Mr. Yearwood’s mother—entered the school library to declare him a Stephen Joel Trachtenberg scholarship awardee. Mr. Yearwood is a JROTC member, a baseball player and an academic standout. His AP Literature and Composition teacher, Felicia Jordan, said she has used his essays, name removed, as exemplars for his fellow students. Stephen Joel Trachtenberg Scholarship Awards 2017 from The George Washington University on Vimeo. Mr. Yearwood, soft-spoken and composed once he recovered from his initial shock, spoke evenly of the dark times his family has faced. He has long wanted a career in law enforcement, he said, and plans to take advantage of GW’s proximity to agencies like the FBI. But his dream took on a tragic dimension when his father was killed in the U.S. Virgin Islands, where he grew up, just a few weeks before his senior year began. 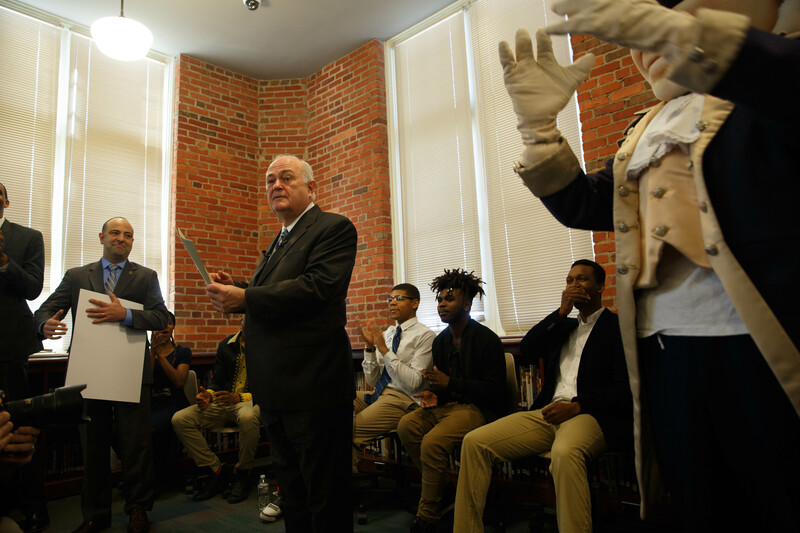 “These ambitious and academically talented young men and women are well on their way to becoming the next generation of citizen leaders,” he said. 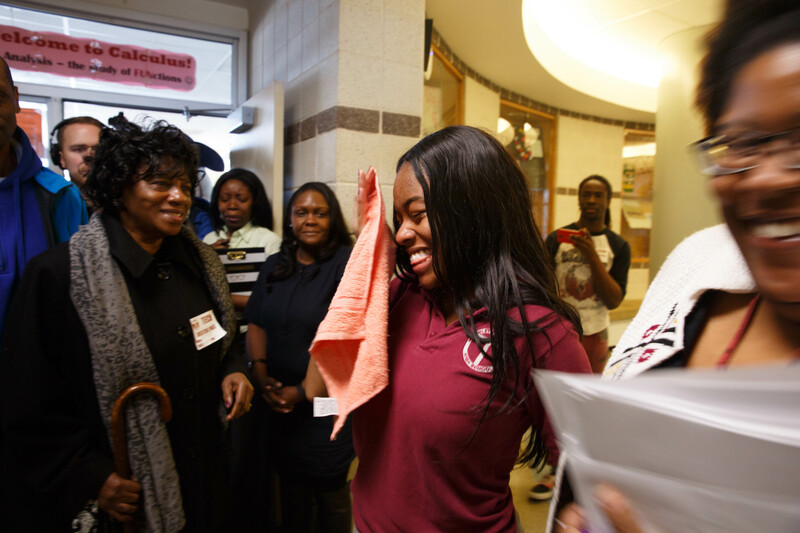 Students are nominated for the award by their high school counselors and participate in an interview process before being chosen. 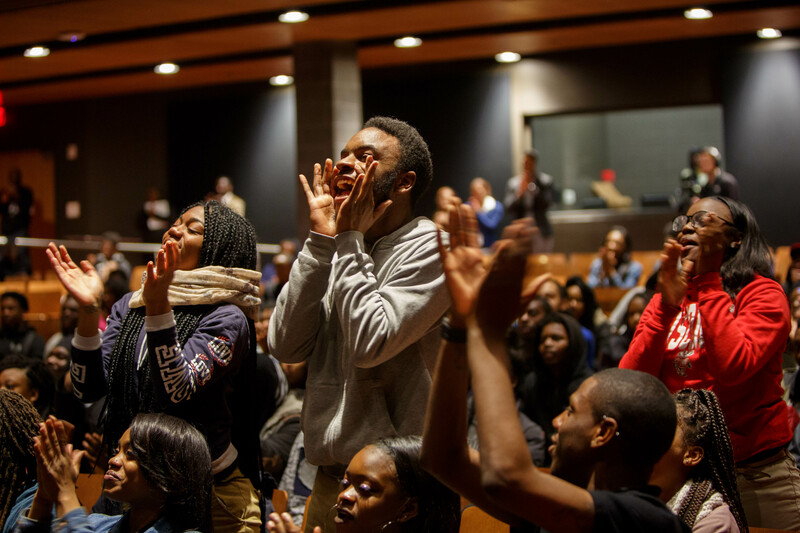 All D.C. residents graduating from an accredited public, charter or private high school in the District are eligible. The scholarships are renewed annually, based on satisfactory academic progress. 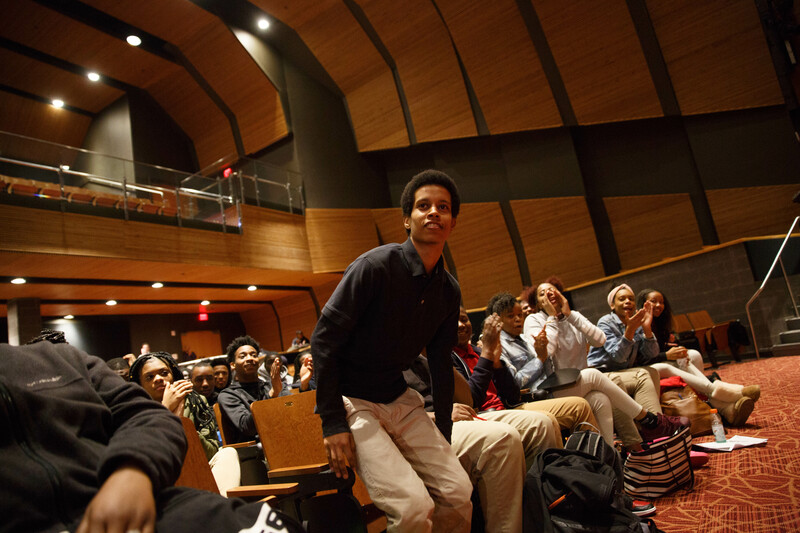 At Woodrow Wilson High School, winner William Davis thought he would be attending an Urban Alliance meeting. But he opened the door of his principal’s conference room to meet not only the GW awards team, but also the excited cheers and raised camera phones of four generations of his extended family—from his great-grandmother, Alice “Grandma Alice” Little, to his grandparents, parents, siblings, aunts, uncles and even an excited toddler cousin. Since 1989, the SJT scholarship program has provided 166 academically exceptional students with full-ride scholarships covering all four years of their undergraduate education. 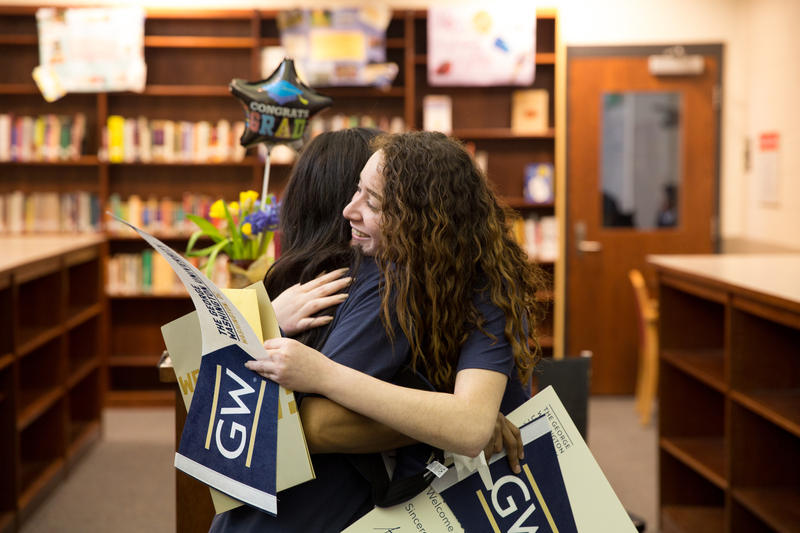 The program has a 92 percent graduation rate, and many recipients are GW students now. 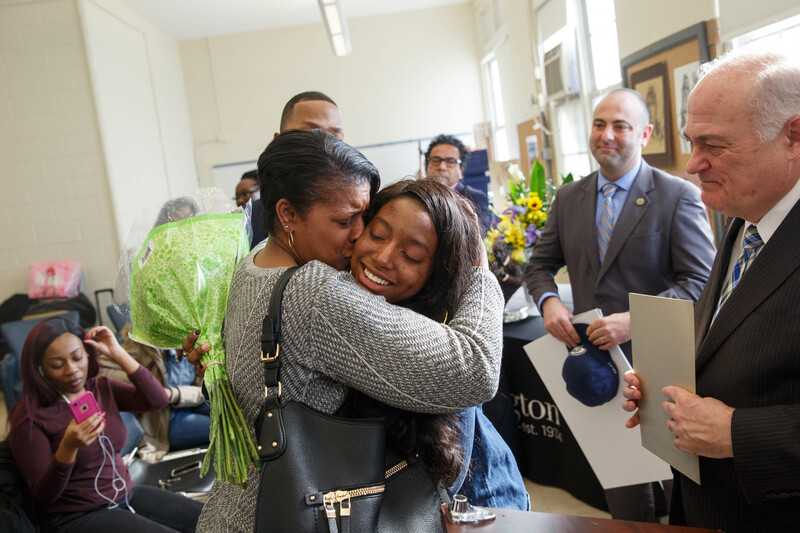 At McKinley Technology High School, SJT winner and McKinley alumnus Byron Fullerton, now a sophomore at GW’s Corcoran School of the Arts and Design, watched from the sidelines as this year’s winner, volleyball team captain and aspiring entrepreneur Emmoni Morrisey, cried into her family’s shoulders. “Any words of wisdom?” a McKinley administrator asked Mr. Fullerton. Ms. Morrisey turned to him, smiling through her tears. Mr. Fullerton, who is studying to be an animator, just smiled back. Sydney Austin of National Cathedral School is captain of her soccer team and editor of the school newspaper. She aspires to be an archaeologist. 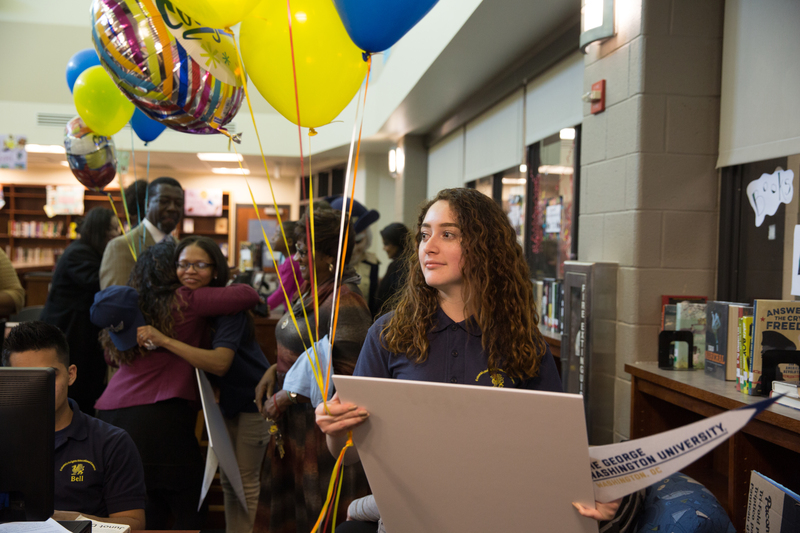 Lorrin Davis of Columbia Heights Education Campus is interested in studying international affairs to pursue her dream of working as a Foreign Service officer. She participated in former First Lady Michelle Obama’s Let Girls Learn program and conducted a case study on the Syrian refugee crisis. 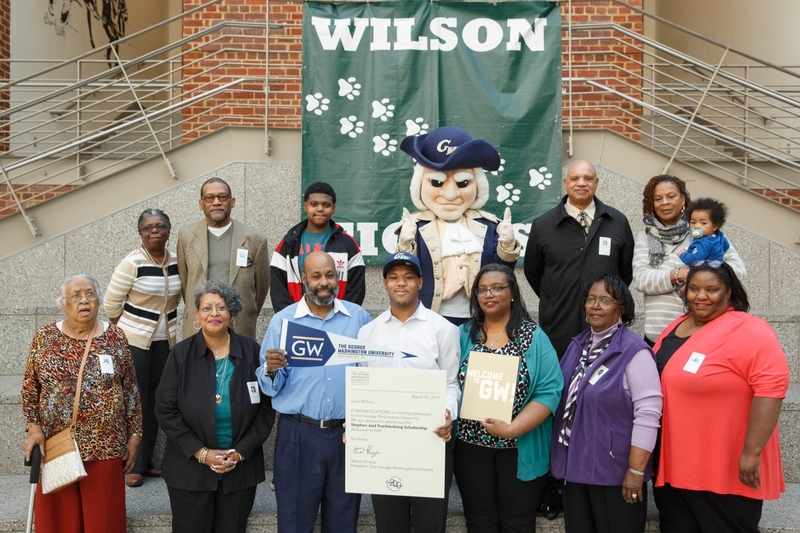 William Davis of Woodrow Wilson High School has volunteered with multiple D.C. programs including City CPR, the Lowell School and Capitol Food Bank. His internship with the Urban Alliance at the World Bank solidified his choice to major in business and pursue a career in finance. Michael Degaga of Paul Laurence Dunbar High School is expected to be valedictorian of his class. He is the mechanical captain of the robotics team and a member of JROTC and hopes to turn his passion for aviation into a career and intends to major in mechanical engineering. 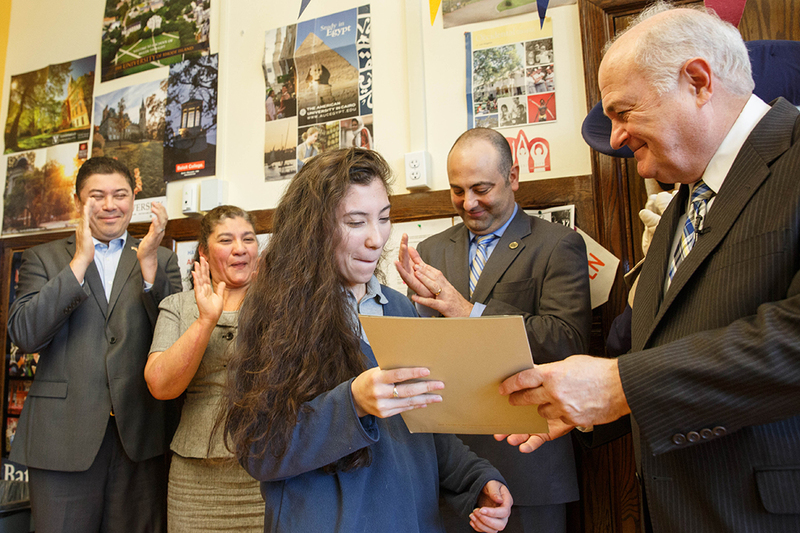 Jenesis Duran of Washington Latin Public Charter School is captain of her soccer team, school secretary and treasurer and involved in the League of United Latin American Citizens. She intends to study international relations. Joel Escobar of Cesar Chavez – Parkside Campus is captain of his school’s soccer team, an advocate for victims of domestic abuse and plans to major in computer science. He is expected to graduate at the top of his class. Cherisse Hayes of Duke Ellington School of the Arts is an aspiring journalist. She is class treasurer, a student contributor at ShareAmerica.gov and interned for the D.C. Superior Court of Appeals as a junior deputy clerk. Ana Lopez of Columbia Heights Education Campus first learned English at age 13 when she moved to D.C. and joined her mom who had left their home country when Ms. Lopez was a baby. 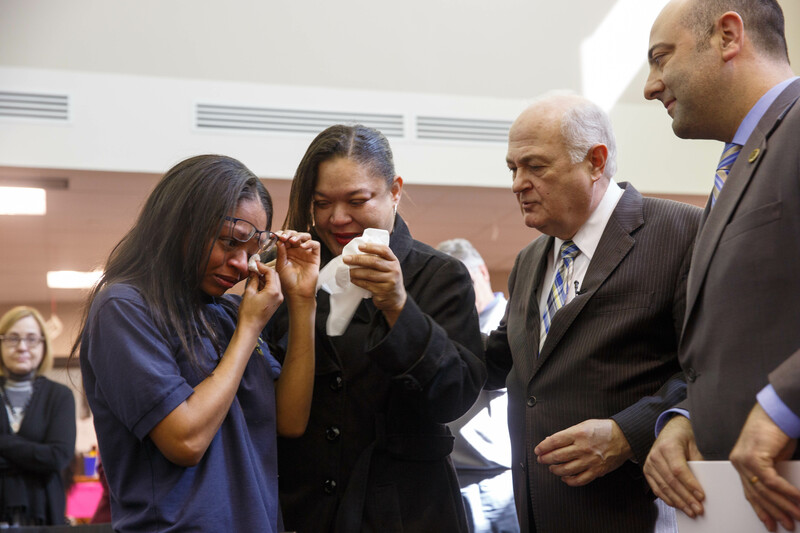 She will be the first member of her family to attend college. 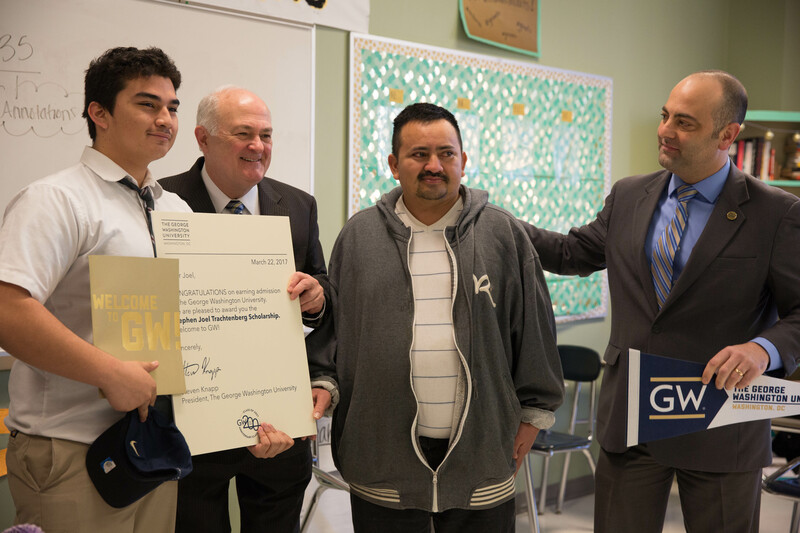 Emmoni Morrisey of McKinley Technology High School is a graduate of the Cathedral Scholars program, a DCPS college summer enrichment and college preparatory program. She is captain of her school’s volleyball team and intends to major in business administration. Adonte Yearwood of Eastern High School moved to D.C. from the U.S. Virgin Islands in order to further his education. A member of JROTC and the baseball team, he intends to major in criminal justice and pursue a career in law enforcement. Stephen Joel Trachtenberg Scholarship Program covers tuition, room, board and books for 10 high-achieving students.